Go to hell Bernie Ecclestone. It took almost a full year to mount your challenge for the the number one spot, but you finally achieved it this week. Many asked if you were too young for this role, many asked if the world was not ready to give the number one spot to a black man, but you proved them wrong. Your determination and willingness to fight right to the very end demonstrated your innate skill; skill that was evident from when you first appeared on the scene a few years ago. The only thing that is regrettable is that your victory means that your chief opponent, who was very deserving himself, is denied the victory that he too had worked so hard for. 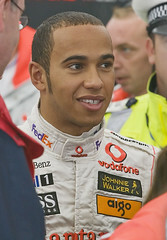 This is why I send my most sincere congratulations to you, Lewis Hamilton, the 2008 Formula 1 Champion! You are currently browsing the iMatt :: The Blog of Matt Clare weblog archives for November, 2008 .